﻿﻿﻿﻿﻿If you﻿'d like to help Chance Tetrick and his family offset expenses associated with his fight against a rare form of leukemia, please consider entering any or all of our three Rebel Raffles for an opportunity to win some fantastic ﻿﻿Ole Miss Football items! You may enter any or all of the three raffles--if there's just one item you'd like, for example, you can enter only the raffle for that item that interests you. Or if you like all three, enter each one! Three separate drawings will take place on July 26th and the winners will be notified via email and this website. 100% of the proceeds will go to the Chance Tetrick Fund. Good luck and Hotty Toddy! ﻿﻿﻿﻿﻿﻿﻿*Once you have made your ﻿donation and PayPal notifies us, your name will be entered into the ﻿﻿raffle! ﻿﻿﻿﻿﻿﻿WINNER WILL BE DRAWN ON JULY 26TH, 2014! 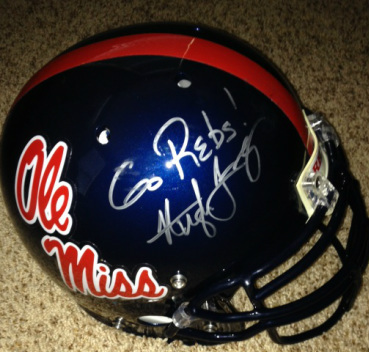 ITEM # 1 - OLE MISS FOOTBALL HELMET ~ Each $10 donation gives you one raffle ticket, one opportunity to win this great helmet. Or, for an even better bargain, donate $25 and you'll be entered THREE times! 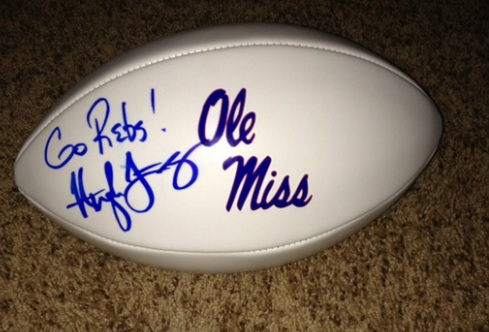 ITEM # 1 - OLE MISS FOOTBALL ~ Each $5 donation gives you one raffle ticket, one opportunity to win this great football. Or, for an even better bargain, donate $20 and you'll be entered FIVE times! ITEM # 1 - OLE MISS FOOTBALL JERSEY ~ Each $10 donation gives you one raffle ticket, one opportunity to win this great jersey. Or, for an even better bargain, donate $25 and you'll be entered THREE times!